Whatever Geography I learned in school has largely been forgotten so before my bro-in-law started working in Segamat, Johor, I have no inkling it was known as the Land of the King of Fruits. According to Wikipedia, Segamat is famed for its durians (alas, most of the harvest is for the export market). Out of sheer curiosity, we spent a weekend in Segamat and stayed at the comfortable 3-star VIP Hotel. The hotel is surprisingly decent and well-furnished, offering 5-star comfort for a quick local getaway. An earlier recce of the town led us to discover Segamat has plenty of good food which was a good enough reason to draw us back. As befitting its name, the 87-room VIP Hotel boasts Segamat's only swimming pool - its lengthy size took us by surprise but it was worth splasing around in during our stay. There is also a modern gymnasium on site in addition to The Chef Restaurant & Bar which serves breakfast buffet and a la carte meals for lunch and dinner. Ample meeting & event space is available with half day (RM70 nett per head), full day (RM90 nett per head) and 2 days/1 night residential seminar (195 nett per head) packages offered. Our Superior King Room furnished in earth, white and cream tones comes with a 40” LCD TV, safe deposit box, tea/coffee making facilities, a rain shower and free Wi-Fi. The spacious room is comfy too (I slept like a log thanks to the firm but not hard mattress) with a practical shower and vanity area. Another plus point is the long mounted work space - this is a boon for those of us who need to check emails and blog. At RM206 nett per night inclusive of breakfast for two, it’s a steal for a Cuti Cuti Malaysia staycation. I daresay The Chef Restaurant's buffet breakfast can rival that of some 4-star city hotels. Besides the lavish spread of nasi lemak, cereals, yoghurt, fresh fruits, noodles (keep your eyes out for the delicious laksa Johor or mee rebus), bread and porridge, there is even a cooking station with a chef to whip up freshly cooked eggs and waffles on request. When we arrived and decided to enjoy dinner at The Chef, we ordered Fish & Chips, Cream of Mushroom Soup, Mee Rebus, Chicken Chop, Cantonese Fried Noodles and Pizza. I like my generous bowl of Mee Rebus. The thick, flavourful gravy is so sedap with sliced fried beancurd, big prawns, half a hardboiled egg and beansprouts in it. Rich and creamy, the mushroom soup was accompanied by toast and deep-fried oyster mushroom for extra crunch. I recall both the Fish & Chips and Fisherman’s Catch were decent too; served with fries and some salad making those dishes a hefty meal. When you travel for business or pleasure, the most important thing is comfort. So on your next trip to Segamat, make VIP Hotel your home away from home. It's clean with good amenities and the price is reasonable. From our maiden visit to Segamat, it hit us this town has plenty to offer. Like their fellow Malaysians, people in Segamat are also fond of eating. The different places we visited are good proof of this. The beauty of Malaysia lies in the assimilation of its people and culture. In Segamat, the Chinese uncle whose prowess at flipping roti canai has spread far and wide. Only us KL ignoramuses didn't know it. The family-run kopi tiam in Kampung Tengah is obviously a famous breakfast outpost, drawing locals and folks from neighbouring towns like Labis, Yong Peng and Gemas. Be an early bird to grab a seat here and watch as an endless succession of roti canai (RM1.30), roti telur (RM2.30), roti bawang (RM1.50) and assorted roti (RM1.80-RM3.40) is made on the spot. Served hot off the grill with a dish of curry, the roti is crisp on the outside and fluffy inside. I salivate just thinking about it! At peak hours, you may need to wait 45 minutes to an hour for your share but heck, it's well worth the wait. Our dining party wallowed in nostalgia the minute we tasted the toasted sandwiches (RM3.40) with sardine-filled omelette. Lightly seared on the griddle, the crusty bread yields spongy-soft omelette smeared with mashed sardine inside. I'd trade Michelin-star dining for this any day. Complemented by cups of local kopi and teh, we also polished off plates of fried meehoon (RM1.50) heaped with sliced raw onion and zingy chilli sauce, as well as fried yellow mee (RM1.50) with a sunny side up egg (80 sen) on the side. Nasi lemak (RM1.30) and soft boiled kampung eggs (RM1.10 each) are also available. 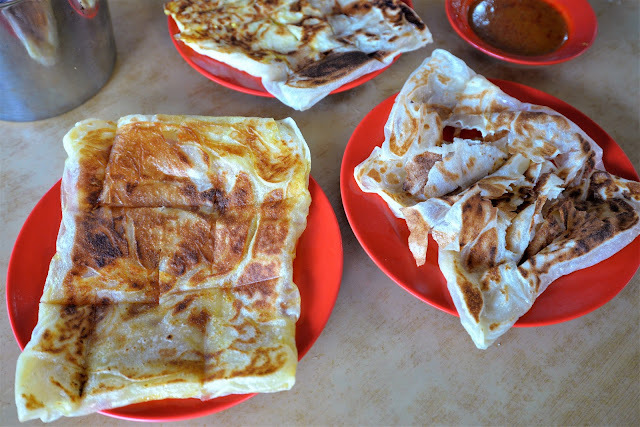 ROTI CANAI KG TENGAH, JALAN CHENG KUOK TONG, SEGAMAT, JOHOR. Tel: 07-932 2681. Open from 6am to 11am or till sold out. Off days not fixed. Ever since I had nasi beringin at Menara Mutiara in KL, I'd fallen for it hook, line and sinker. The fragrant spice scented rice, that crispy fried chicken, the zingy hot sambal...fffuuuuhhhh, power! Guess what? Segamat also has its own super-sedap nasi beringin. I remember being filled with great anticipation when we stepped into Selera Nasi Beringin and we weren't disappointed. Other customers must have given their thumbs up to this corner restaurant too as on our recent visit, Selera Nasi Beringin has just opened a new, air-conditioned Bamboo Room to enhance diners' comfort. We love the retro floral-patterned enamel trays used for serving the rice. One corner of the eatery is dedicated to vintage knick-knack display: old cigarette tins, a rotary phone and a manual typewriter, adds vintage appeal to the shop’s ambiance. A standard serving of spiced rice comes with cucumber and pineapple pickles, sambal and your choice of fried chicken, chicken curry, beef or mutton curry, or ayam masak merah. The whole ensemble is so appetising, many customers often ask for repeat helpings. SELERA NASI BERINGIN, NO.24, JALAN UTAMA 2/7, TAMAN UTAMA, SEGAMAT, JOHOR. Tel: 012-848 8055. Open Mon-Sat from 7am to 12midnight. As a 'banana' Chinese, I know my knowledge about Chinese cuisine and its vast provincial roots is sorely lacking. So when I had my maiden encounter with Song Hua ban meen, I didn't even know its proper name. The silky, flat ribbon noodles crimped along the edges are so pretty and Old Street 23 dishes up a homey version. We all lapped up the tasty broth which also had fish balls, pork meat balls and sliced pork with a lettuce leaf or two in it. Truly, unpretentious comfort food to satisfy the soul. Tucked away in a refurbished old shop house along the Segamat River, Old Street 23 Café offers an extensive menu: running the gamut of local, Western and snack items to hot and cold drinks, and dessert. I find the local kopi smooth with enough caffeine buzz to boost my alertness. OLD STREET 23 CAFÉ, 70, JALAN SULTAN, SEGAMAT, JOHOR. Tel: 07-932 5501. Open daily from 11am to 11.30pm. Johor is known for its asam pedas, a tantalisingly hot and sour dish with fiery red hue to boot. There has been much debate whether the Melaka or Johor version is better but I like both. It is said Johor asam pedas uses daun kesom (also known as laksa leaves or Vietnamese mint) while Melaka includes kaffir lime leaves so the aroma and resultant taste varies slightly. Also some claim Johor's version is more delicate compared to Melaka's which tends to be more potently flavoured. Anyway, we discovered Segamat has its own claim to fame in the asam pedas stakes too once we stepped into Sukaku restaurant. Tucked away in a housing area, hordes of people flock to Sukaku for its signature Asam Pedas Fish (RM49.50). True enough, the hot and tangy sauce was tamer than the piquant versions from Melaka I've sampled in the past. But the red snapper we had was so fresh and sweet, it reeled us in at first bite. It was a good thing we arrived on time for dinner as after 7.30pm, the resto was packed to the rafters. Despite having to wait, we were blown away by the slew of good food churned out by Sukaku. Chunks of fish were embedded in the serving of Otak-otak (RM9) we ordered which made it superbly tasty. Us city slickers were reeled in by the show-stopping Fried Tongue Sole (RM22 for 9 pcs). Looks-wise the flat fish didn't look at all impressive but golly, once we crunched into them, we were hooked instantly. In fact, we insisted on a second helping just to satisfy our cravings. Our hearty appetite was fuelled further by the house speciality of Fish Head Curry (RM41.50). The delectably rich gravy was sublime for dousing over white rice so whatever thoughts of going carb-free disappeared rapidly once everyone tasted this dish. The fish head was fleshy and sweet, and we had a gala time picking out the long beans, brinjal and okra submerged in the bright, orangey gravy to savour. Smoking hot with a mild pungency best describes the Squid & Prawn Sambal with Petai (RM29 big serving). No wallflower in the flavour department this and we made quick work of the tender squid and sizeable prawns. Again, this begs to be eaten with white rice. The bare-frills set-up is similar to most tai chow restos you'd find in the Klang Valley. Perhaps it's all for the best since there's nothing to detract attention from the food eh? KEDAI MAKAN ASAM PEDAS SUKAKU, 49 & 51, JALAN PUTRA, BANDAR PUTRA, SEGAMAT, JOHOR. Johoreans also have a penchant for bak kut teh (BKT). In Segamat, there are a handful of eateries specialising in this hearty old-skool fare. Although the BKT doesn't have strong herbal flavour that I'm partial to, the soup's rich, meaty sweetness makes it slurpilicious. My Penangite friend was thrilled to bits to see bak kee prepared fresh on premise. It's a traditional offering of lean pork pieces coated in tapioca starch (giving the pork a slippery smoothness) cooked with or without innards, liver and intestines in soup. Deep-fried shallot and chopped spring onion are sprinkled on before it's served. She gave it the thumbs up. Leng Kee is also known for its compressed disks of spiral yellow mee. Once blanched, the noodles become a canvas of sorts to enjoy with the hearty pork soup. but I tried some 'naked' yet it was surprisingly good too. LENG KEE, NO.2, JALAN SALIM, KG. ABDULLAH, SEGAMAT, JOHOR. Evenings see Dolland Food Village - a semi open air food court - comes alive with stalls dishing up a nice variety of food and drinks. There's a large screen projection for sports and movies to keep patrons entertained too. The best find for me has to be the Orh Chien or oyster omelette. For once, you can actually see plump baby oysters amidst the blobs of scrambled egg and potato starch (some batter uses a mixture of eggs, rice flour and starch). Our palate hums with pleasure at the fluffy yet crisp at the edges texture. DOLLAND FOOD VILLAGE RESTAURANT, JALAN SAMSU, KG. ABDULLAH, SEGAMAT, JOHOR. Another perennial breakfast delight of wantan mee can be found at Yik Kee. We were told there are several shops with the same name as the Chong family has a strong hold in Segamat on this popular noodle dish. The Kon Lou Char Siew Wantan Mee (RM4.30) are decent, reminiscent of those from my childhood days although the dark soya sauce not as deep-seated. Taste-wise, it's better than what is dished up by dodgy 'instant' hawkers in the Klang Valley. YIK KEE WANTAN MEE, NO.259, JALAN PEE KENG HAI, KAMPUNG ABDULLAH, SEGAMAT, JOHOR. Open daily from 10.30am to 3pm or while stocks last. The curry puffs from this nondescript stall in Segamat Old Town are such hot sellers that sometimes they are finished even before the stall opens for business! We were lucky to grab some on our last visit. They reminded me of flying saucers as the pastries were round with crimped edges. The delicious stuffing of curried potatoes even has bits of chicken inside. To stave off your cravings before the puffs are ready, try the vadai hot from the wok sold at the next stall. CURRY PUFF STALL, JALAN TENGKU AHMAD, SEGAMAT OLD TOWN, SEGAMAT, JOHOR. Open from 2pm onwards.